On their turn, a player can choose to attempt to accomplish one of the 6 situations in the museum currently available. The player rolls 6 special dice (showing results like investigations, peril, etc.) and tries to get enough results that match any of the tasks on the card. For example, one situation card may show 2 tasks: one requiring 2 lore scrolls, and another requiring 1 peril plus 2 investigations plus 1 terror. If a player completes one of the tasks, they set the dice needed to do so aside and can roll the remaining dice again to try to complete more tasks on the situation card. If the player doesn’t complete any of the remaining tasks on a roll, they discard a dice and re-roll their remaining dice again until they complete all tasks or fail. Players can use special items, spells, allies, etc. that they’ve gained along the way to roll a few better dice, plus the player may use clue tokens to re-roll any of their dice before seeing if they have completed a task. If a player manages to complete all the tasks on a card, they get the benefits listed and a new situation is drawn to take its place. Also, they can spend any collected cards and monsters to gain equipment. However, the player will suffer the negative effects of a card if they do not accomplish all of the tasks – which can result in losing stamina, health, equipment to having a monster appear or even and a dreaded doom token being added. Any failed situation card can be attempted by another player but they must start it from scratch. As with Arkham Horror, the Great Old One (hopefully slowly) accumulates doom tokens and will awake if they gain enough of them. Every 4 turns, the clock strikes and a new mythos card enters play which can have bad immediate effects as well as on-going effects until a new card replaces it. If a player reaches zero sanity or stamina then they are dead and can start a new character, although this does add a doom token. If the Great Old One awakens, the players must battle it which is often a very hard task. Overall, Elder Sign is Arkham Horror The Dice Game. Whilst it is dice-rolling, there are still a lot of tactical decisions to be made like which tasks to attempt, when to use equipment, which situations need to be defeated first based on their rewards and penalties, etc. There are loads of situation cards so the game plays differently each time. Also, the Great Old Ones all have different effects on each game too, plus there are lots of different investigators with different mixes of skills too. So, the game’s replayability feels good. The mix of situations and working out which ones to attempt is an interesting challenge especially as some situations need their tasks to be completed in a specific order and some situations are more suited to certain characters than others. Purely attempting the easier situations only gains you the smaller rewards so can waste time; however, you need some of the smaller rewards like clues and items so you can achieve the more difficult situations. Also, monsters (which are tasks with requirements that get added to situations) enter play during the game and make some situations much harder so situations can change over time. After playing Elder sign a few times, I really like it. It’s fun, you know what risks you’re taking and feel you have some control over the results even though it’s dice-based. I haven’t seen the group I played with cheer so much for any other game apart from Arkham Horror itself when certain results were rolled. The key downside to Elder Sign is the rules which, when you start playing you realise, are too brief and can be confusing. This is compounded by the fact that there aren’t enough examples either. However, the rules are simple enough once you understand the specific terms being used throughout the rules (which can be a bit like understanding legalese. Once I was playing the game a bit, and re-read some sections of the rules over and over, it all made sense. There are still issues with the clarity of some of the timings which need addressing though, but they’re not that important. I found it plays well solo as well as with multiple players and is one of the very few single-player games that I enjoy playing. Also, it seems well-balanced as all the games I have played have been fairly close. UPDATE 7th October 2011: Elder Sign may not be as well-balanced as my early games showed as I played 5 games with 2 characters (one per player) and we won all the games (4 of them with only a few doom tokens on the track so very comfortably indeed). 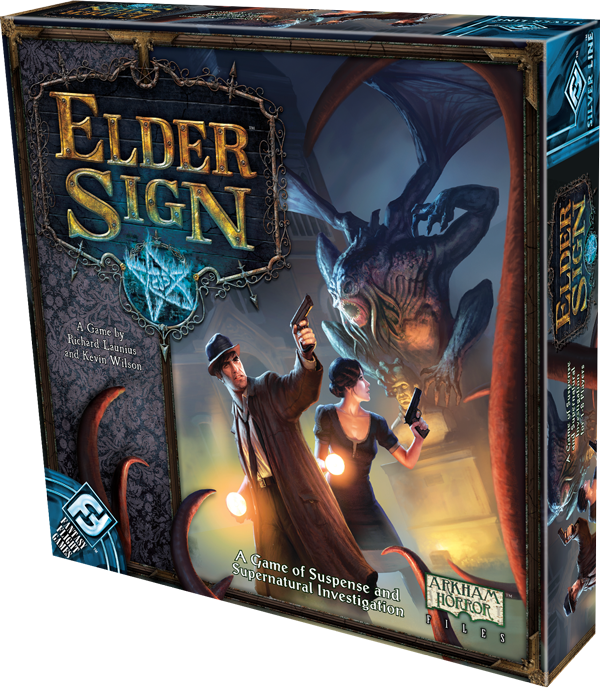 It’s still a fun and interesting game which I like a lot, but I shall be adding extra diffculties in future games to ensure it remains challenging, such as no buying elder signs with trophies, lower sanity and stamina, some characters will not be used, double mythos cards, etc. I expect future expansions (it’s FFG so I’m sure expansions are a certainity) will make it more difficult. 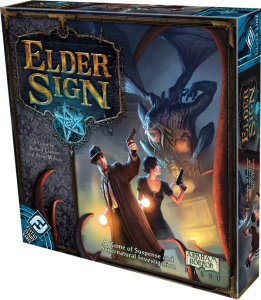 This entry was posted on Monday, October 3rd, 2011 at 9:35 am	and is filed under Board Game Review, Board Games, Elder Sign. You can follow any responses to this entry through the RSS 2.0 feed. You can leave a response, or trackback from your own site.